Between Beijing and the Expert: Is Public Opinion Changing China? 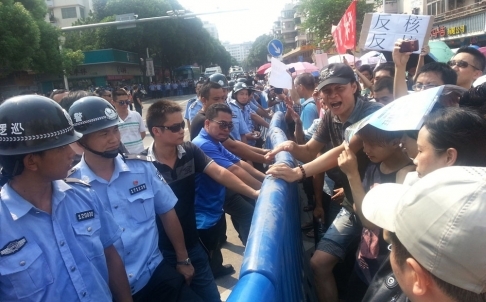 One day after a rare public protest, Chinese authorities said Saturday, July 13 that they were abandoning plans to construct a uranium processing plant in southeastern China, where residents raised concerns about its safety and potential environmental impact. The quick cancellation of the 37-billion-RMB project is a surprising result, bringing out nuances and new insights into public opinions’ influence in the latest government decision. A NYT article on the incident leaves the impression that the Chinese government was merely reacting to a spontaneous and unanticipated shift in public opinion. What it failed to mention is the Heshan City government’s proactive role in setting up a series of public outreach efforts during the pre-development planning phases as early as in October 2012. These included a visit to an existing uranium plant in Sichuan by a delegation of officials as well as peasants living at the proposed site. After months of preparation, the government finally signed the contracts with the China National Nuclear Corporation and paid a total of 140-million-RMB compensations to the local peasants. The pre-development phase included construction of a weather forecast station for data collection, which was later questioned as the beginning of official construction. The government posted news on the construction plan and even a blog post that welcomed comments and suggestions on its website, and followed up with continuous updates on the subsequent stages of the project. Additionally, face-to-face meetings with netizens were held and posters were made accessible to the public, explaining the clean technology employed in the project. Yet the government’s effort to build public support for the project didn’t seem to pay off. The majority of the people found the notion of “nukes” objectionable and frequently cited the failures in Japan and in Russia. Most of them ignored the few but knowledgeable voices in support of the government arguments for increasing economic benefits and relieving energy shortages. Thanks to the growing sophistication of Chinese social media technologies that make it harder for internet censorship, numerous “Wei Bo” tweets against the project spread out and even instigated calls for a mass protest. In response to the crisis, the government arranged several media conferences, where authoritative experts and responsible agents gave scientific and technical explanations to alleviate the majors concerns over the safety of the technologies involved, the location and the design of the plant. The endeavors, however, did not stop the mass protest, and the government gave a firm order to cancel the project altogether. Throughout the chain of events, the government’s constant attempts to establish some sort of authoritative scientific truth are based on the assumption: because the public are scientifically ignorant, information and education about the scientific facts will naturally dispose them to agree with any public project involving science and technology. This assumption (from the famous “deficit model” which attributes public skepticism or hostility to a lack of scientific understanding) is severely challenged in this case, where presenting pure scientific facts failed to (not that they cannot) convince the people. “I just don’t like to build a nuclear plant here. No matter how you maintain it is safe, Fukushima and Chernobyl told me: The (disastrous) aftermath can be too serious.” The prevalent fear reflects the frame that the nuclear energy is little scientifically understood but portrayed as a “Pandora’s Box”, which could have irreversibly disastrous effects on humanity. “Even though the government claims that this plant is harmless and 100 percent safe, we just don’t trust them … We’re already scared to drink the water. Maybe it will be O.K. for this generation, but what about the next?” The past government oversight and mismanagement in environmental and food safety issues have still been daunting, making the public accountability frame very effective. In sticking to the deficit model instead of understanding the existing public values and their preferred communication channels, the government could risk widening the knowledge gaps, or lose the opportunity of effective communication. As a lesson, the French government had some success in popularizing nuclear energy despite initial protests by framing the issue in ways that are culturally acceptable to the people. Similarly, the Chinese government could commit more to early public engagement to achieve effective science communication: perhaps with appropriate frames and dialogues, a collective decision could be reached that wouldn’t put the experts and the public on a collision course and dismissive of one another. Nevertheless, in this case, the Chinese government clearly foresaw the potential objections of the nuclear project, and then invited expert opinions and media coverage long before posting the social risk assessment, which is part of a structured initiative for systematically drawing public opinions in government decisions, improving government transparency in response to accountability issues. Unfortunately, such communication style still operates on the deficit model. It focuses mostly on disseminating knowledge to the diverse, unengaged audiences. For three months between signing the contract and posting the assessment, the expert opinions reached officials, media, and certain interested citizens. Until the public comment period was approaching its end majority of the people were either uninterested or not aware. Behind this incident lies growing public concerns about increasing environmental hazards created by the rapid development of China. I would call the cancellation a victory to the will of the people, especially the rising middle class who considers themselves as citizens capable of influencing policies. As a matter of fact, the cancellation of the Heshan uranium plant is not unique: among the 51000 key government investments since 2011, over 900 were cancelled due to serious “social-stability risk” while 3100 were modified. “The leadership of China decided a while ago that they would distinguish two kinds of protests,” an adjunct professor in Chinese University of Hong Kong commented. They will crush those perceived as anti-government or anti-Communist Party, while telling local governments to compromise on demands that are environmental or economic in nature, he said. This might explain the fact why the illegal protest was not touched at all. Acknowledging the growing influence of the civil society, the government has become more accountable and shown increasing sensitivity to public concerns in environmental and technological issues. The important point to note here is that a fuller account of the events leading up to the cancellation portrays an image that is quite different from a stereotypically top-down authoritative policy-making system, where no protest would be tolerated and reported. Among the many cases, the cancellation indicates a slowly emerging trend of public opinions’ growing influence in changing decisions made by policymakers and experts in China that is to an extent proactively facilitated by the government, with some clear restrictions of course. The author is an undergraduate intern at the Consortium for Science, Policy & Outcomes in Washington DC. This is a well-researched, informative, and very balanced post. It seems appropriate to me to include the author’s name at the top so that s/he receives appropriate recognition for this fine work. This is a most excellent post, drawing out a case study that provides an interesting counterpoint to many of the dominant narratives in western media about the Chinese government and public participation in decision making. It also provides documentation of a trend I noticed while visiting Jingsu province – the ready acknowledgement of the tensions between environment and development, and a long-term vision of and commitment towards shifting to sustainable models for industry and society. I’d encourage you to get in touch with other students looking at public engagement, protests, and technology in non-American contexts, such as Monamie Bhadra (http://archive.cspo.org/people/bio/bhadra/) at the Consortium for Science, Policy, and Outcomes. I’d also encourage you to think about developing a full case study for academic publication here, drawing connections between the theories of engagement and participation conventionally examined in a western context and this case study. I agree with your assessment of the work, Rick, though I believe the author requested to be published under a pen name in this case.